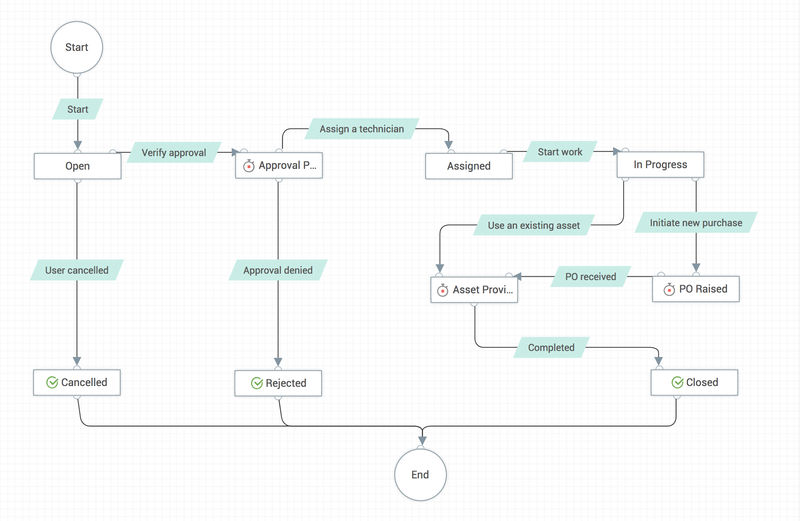 Design the complete life cycle of a ticket visually using a simple, drag-and-drop canvas. Break down the life cycle of a request into various statuses and transitions, i.e., conditional actions required to move from one status to another. It is available in both the on-premises and cloud versions of ServiceDesk Plus. Any request in ServiceDesk Plus goes through various statuses such as Open, On hold, Waiting for an update, Resolved, and Closed. With RLC, you now can design the sequence of the statuses along with conditions and actions (transitions) required for every status change. Transitions are “conditional actions” required to move on to the next status. We can execute these conditions before, during, or after a transition. How to start using RLC? Take a quick tour of Request Life Cycle and how to configure transitions. Request life cycle management is a functionality in ServiceDesk Plus.